Phil & Carol invite couples & families to stay at their romantic holiday retreat for short and long breaks. Lying only 1 hours drive from the M25, ‘High-Hoe’ in the East of Mersea Island is the perfect escape from the stresses of the modern world. Ideally placed for cycling, walking and wildlife. Additionally enjoy 'High Hoe Hut' a front row beach hut at West Mersea for a traditional beach holiday. A very old dwelling that almost fell down, it has been rescued, lovingly restored and modernised. 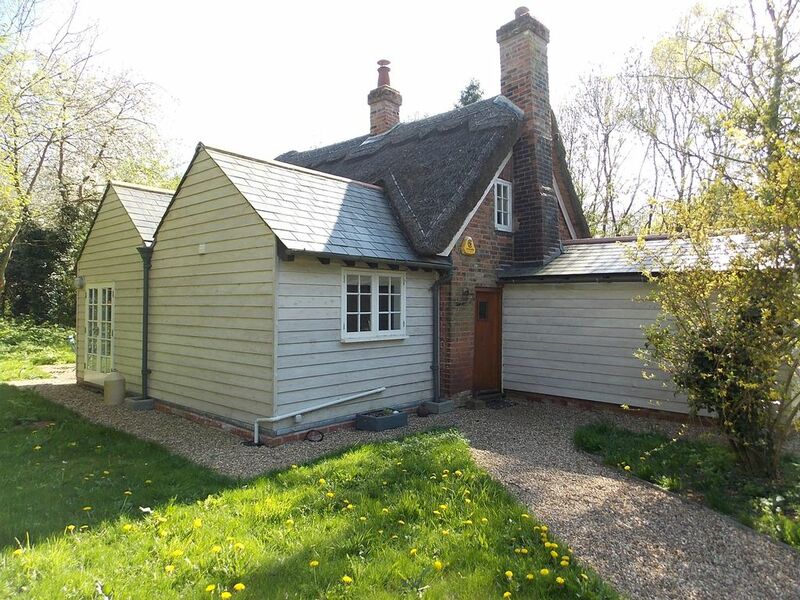 Essentially a thatched cottage in a wood it dates back some 500 years when it started life as a tiny medieval hall. If you’re looking to escape a hectic life or want a romantic break or perhaps just to get away from it all, ‘High Hoe’ is waiting for you! Chances are you’ll be amazed at the sight of a hunting barn owl or one of the newly introduced red squirrels, see no one other than the occasional walker and be woken only by the wind in the trees or the sounds of nature. 'High Hoe Hut' is a short drive away at West Mersea Beach. This is secret Essex, remote but accessible and remarkably a range of beaches, shops, pubs and restaurants including the world famous Company Shed, are all within 5 to 15 mins drive. High Hoe is suitable for up to 4 adults and 2 younger children. A highchair is available on request. There are 2 upstairs bedrooms which have a white washed loft feel and a single bedroom downstairs which has french doors to the lawn. There is one small downstairs wet room. An open plan kitchen and dinning area with double french doors to the garden, gives on to a beamed sitting room and inner hall. Outside is a very private garden and parking for two vehicles. ‘High Hoe’ Cottage is situated at the far end of Shop Lane, the final approach is a passable unmade road adding to the sense of seclusion. The cottage is only 200 metres from the coastal path and Cudmore Grove Country Park lies a further mile along the path. Sorry no pets and non smokers only. Phil is retired with a lifelong interest in antiques, period property and gardens. Carol is a professional artist and teacher. They live in Essex with their 3 children. Having lived in Essex for most of our lives we had long been in love with Mersea and it's unique atmosphere and attractions. We were delighted to have a chance to acquire such a beautiful property in one of our favourite places. 'High Hoe' is at the same time easily accessible and wonderfully secluded. Even at the height of the holiday season it resists the rush and stress of the modern world. You feel so close to nature and the sea and yet only a few minutes walk or drive from all the amenities the island has to offer. High Hoe is suitable both for couples and families. There is free Wifi available. The free use of the beach hut will give your kids endless fun on the sandy beach at West Mersea. Very private surrounded by woodland. Front row BEACH HUT available FREE of charge. Look out for RED SQUIRRELS in the garden. Had a lovely 3 night break at High Hoe in August. The cottage was very quirky but really comfortable and we had a fun afternoon escaping the rain just playing games and relaxing in the lounge. The beach hut was an added bonus, unfortunately not left totally clean by the previous guests but we didn’t let that spoil things for us. All in all a perfect little getaway for the family. Charming house, great beach hut! Very charming, lovely place to stay for some peace and quiet and the beach hut is fantastic! Lovely stay at the High Hoe cottage! Lovely cottage in a nice quiet area. Very tranquil, we heard and saw some rare birds. Everything is well kept and clean. Very complete cottage. We really enjoyed our stay - the upstairs double bed was heavenly, we however did not sleep in that bed. Our sister in law did. We took the single beds in the downstairs bedroom and I found the mattrasses to be not as comfy as the double bed upstairs. Pillowtop mattrasses would have been just perfect for those beds also if you ask me. If that change would be made i would go back to stay there at the blink of an eye. The surrounding area has enough to offer. We did go to West Mersea a few times though we never got around to checking out the beach hut. That would have been great. We enjoyed having dinner at the pub nearby. Nice people - nice area. I recommend this place! We loved our stay at your cottage, the pheasants on arrival were unexpected. The cottage was very quirky a real get away. It was very clean and we'll equiped. The use of the beach hut made our stay extra special. Communications were excellent with the owner. Would highly recommend. This cottage had the ultimate ‘wow’ factor. Our children’s response was “we are in a real life fairytale!” Absolutely stunning and tranquil. The beach hut was the icing on the cake for us, 10 mins drive away and just perfect. Our children love playing outdoors so this holiday was wonderful for us. Free WiFi, 200 meters from coastal path, good food in local pub 1 mile away. Great wine from Mersea Island vineyard and fantastic seafood all within easy reach. Sorry no pets. For Christmas period please enquire All payment must be made by cheque or bank transfer A non-refundable deposit of 25% is payable at the time of booking. Balance due 6 weeks prior to arrival and to include a refundable good house keeping deposit of £100. For bookings made less than 7 weeks before arrival the total cost is due immediately.